It very easy to see that smart phones are very rapidly starting to rule our lives. And how can it not? They does everything for us from keeping our calendars, stores all the photos , gives us access to our Facebook, Instagram accounts and, ohh yeah does all the actual phone stuff like makes calls and sends text messages. With the rise of the use of smart phones, it doesn’t take a detective to realise that everyone now constantly have their heads down and noses in these devices. 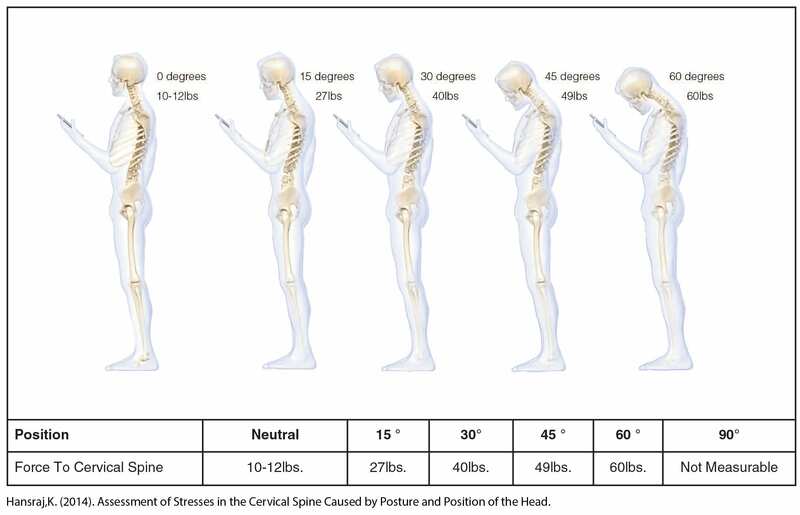 Other than making people less social in real life, what is long-term use of smart phones doing to our spines? In 2014 a popular study my Hansraj. 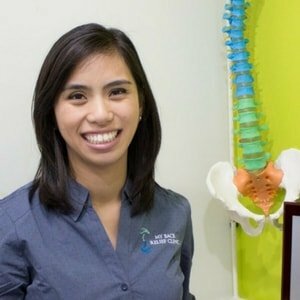 K published a paper in the journal Neuro and Spine Surgery called “Assessment of Stresses in the Cervical Spine Caused by Posture and Position of the Head”. 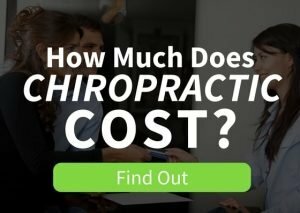 What they found you will put more strain/force on the cervical spine (aka the neck) as you increase the angle of looking down. As you can see in the photo below, study was done in America, so I’ll put it in measurements that us Australians will understand. A minimal head tilt of only 15degrees already puts 12kg of force on the spine. Whilst a more extreme head tilt down to 60 degrees exerted a force of a whopping 27kg on the neck part of your spine. That’s almost equivalent to having an average 9 year old sit on your head for 2-4 hours of the day, not very comfy after a while! This can put unnecessary stress on the joints, ligaments and muscles in the neck and almost certainly early degenerative changes of the neck. Look straight– instead of bringing your face down to your phone, why not bring the phone to your face. That means lifting up the phone to eye level so that your neck can stay in a neutral position. Take breaks to avoid the “Creep”- Ligaments in your neck are made of collagen, which means that it can stretch similar to an elastic band. “Creep” is a process of deformation of the ligaments which happens over time under constant stress. 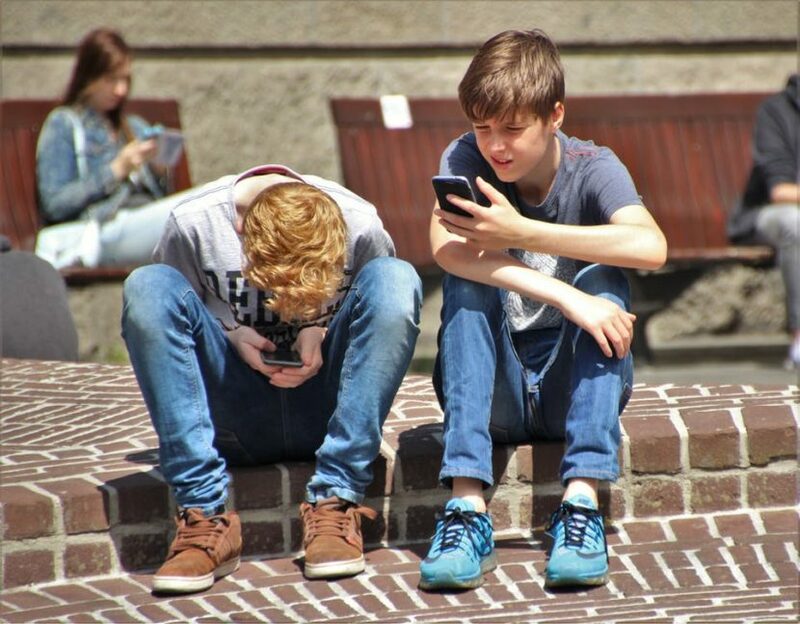 Taking breaks from looking down at phones every 30 min can help avoid the long-term effects of the deformation of ligaments. Exercises– A great way to reverse the effects of prolonged neck flexion is neck extension. Simple exercises such as the prone superman shown in the photo are great at strengthening the back and shoulder muscles that inevitability get weak from prolonged periods of looking down. Download an app– There are a few free Apps out there that help make you more aware of your phone use. For android phones, “Text Neck Indicator lite” keeps tabs on you posture whilst using your phone. Available on apple and android phones “My Neck” is a free app for neck exercises that battle against the text neck posture.